PRINCETON — Anshela Jaramillo's long black hair rose from her scalp Thursday morning as she touched a Van de Graaff generator set up at Princeton University. Electrical charges were passing through Jaramillo's body as she stood in a circle in the lobby of the university's Frick Chemistry Laboratory, clasping her classmates' hands. "It really hurt, but it was fun at the same time," said the eighth-grader from Melvin H. Kreps Middle School in Hightstown. "As long as you're together holding each other, the circuits will keep on going through everybody until the end." 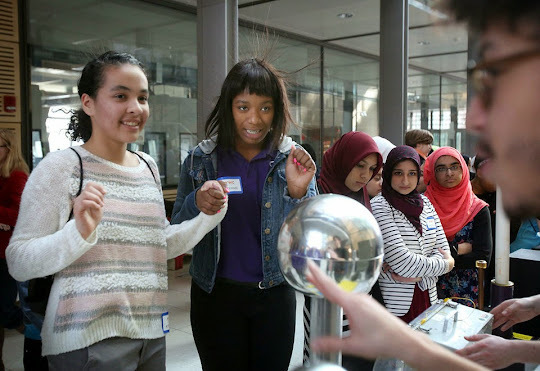 The U.S. Department of Energy's Princeton Plasma Physics Laboratory, located in Plainsboro, hosted its 14th annual Young Women's Conference at Princeton University Thursday as way of sparking students' interests in science, technology, engineering and mathematics. "Not only does it give the students the appreciation for the sciences, but it gives them career ideas, and it makes them see that it's not just working in a lab. There's some exciting things you can do in STEM," said Shannon Greco, PPPL's science education program leader. "It's also just to give them an appreciation and an understanding of science so they're just effective citizens in the world." Only about 25 percent of computer and math scientists in 2013 were women, according to the National Science Foundation. About 15 percent of engineers and 12 percent of physicists and astronomers were women. Nearly 500 students traveled Thursday morning from 60 middle and high schools throughout New Jersey, Pennsylvania and Maryland to participate in hands-on activities and tour various laboratories on campus where researchers were working. "It's a good opportunity for girls to learn more about science," Jaramillo said. "If they want a career in science, they can learn more about that field here." About 25 exhibitors were set up inside the Frick building, showcasing everything from 3-D printers to hydrogen gas-powered model cars. The event's keynote speaker was Kerstin Perez, an astrophysicist at Haverford College studying dark matter. Among the exhibitors were students from Robbinsville High School, who computer-programmed a robot named Nao to dance the macarena. "We bought him assembled already, but we programmed him. He acts like a human. He has an eye sensor, also hearing, and he's also got a touch sensor," said senior Claire Breyta, a member of the school's Girls Who Code club started by junior Rithika Korrapolu. Members of Girls Who Code, a national nonprofit organization, introduce younger students to the basics of computer science. Breyta said their goal is to expand their education outreach to the elementary and middle schools. "I had a lot of background in it, so it wasn't too difficult to code him," Korrapolu said of Nao. STEM careers should not be overwhelmingly represented by men, Jaramillo said. "We all have an opportunity to do something important," she said. "I believe that women should get a chance, because we're all together in this."